The trickiest part of writing a tie-in novel with a movie or TV franchise is making the characters speak with the voices we have come to know on screen. In this sense, Doctor Who: Engines of War is a success. 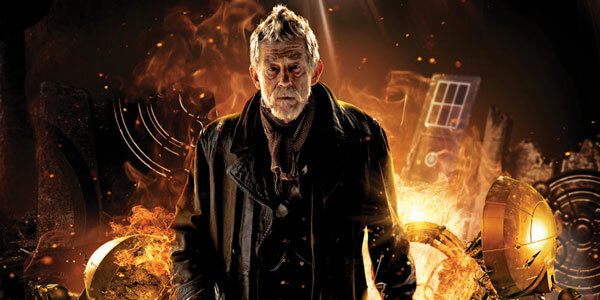 Author George Mann brings the War Doctor to life in this adventure that takes place during the Time War. Throughout the course of the story, I could hear John Hurt’s voice in the dialogue. Additionally, Mann captures the tone of the Doctor Who universe. The tale begins with a flotilla of battle TARDISes engaging a Dalek fleet near the Eye of Tanatalus, a space-time anomaly controlled by the Daleks. During the battle, the Time Lord contingent is destroyed and the War Doctor narrowly escapes a crash landing on the decimated planet of Moldox. Here, the Doctor meets a young resistance fighter named Cinder. Together, the Doctor and his new companion infiltrate a Dalek stronghold and discover the Daleks have been spawning new and horrible offshoots of their race. Worse still, the Daleks have developed a weapon that not only dematerializes its target but removes all trace of it in the timeline. The Doctor and Cinder hightail it to Gallifrey to warn the Time Lords of this new development, only to discover that Rassilon has created his own monstrosity to combat the Daleks. Mann has crafted a fast-moving adventure. He paints a compelling picture of two warring sides – the Daleks and Time Lords – willing to torch all of Reality in order to emerge victorious, no matter the cost. It is clear that the Time Lords have become much like the Daleks in the sense that they are more concerned about preserving their own existence at the expense of “lesser” races. And the Doctor’s anger with his own people feels real. One does not have to be a deeply knowledgable fan of Doctor Who to enjoy this novel; however, a major plot point draws from the classic serial “The Five Doctors”. Viewing this will add depth and understanding to that element of the novel. 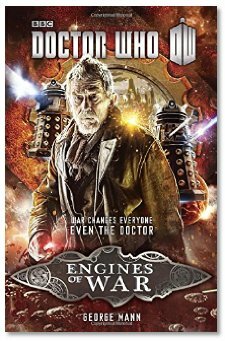 Overall, “Engines of War” is a well-crafted Doctor Who adventure. The book gives great insight to the concept of how the Time Lords and Daleks are two sides of the same coin. I hope a sequel is in the works which will illuminate how the Doctor was driven to the decision to use The Moment to wipe out both races as shown in “The Day of the Doctor”. “Engines of War” is a well-crafted Doctor Who adventure. The book gives great insight to the concept of how the Time Lords and Daleks are two sides of the same coin.